I was planning to make pulled pork tacos for dinner one night last week (I will post that one later) and I needed a side dish. Normally, we have Mexican Rice or something equally "blah." I wanted something different, gosh darn-it! So while I was at the grocery store I noticed all the fabulous looking fresh corn. Bingo! But plain old corn sounded like it belonged in the aforementioned "blah" category, so I decided to jazz it up a bit. You'll notice in the recipe below that I used a jalapeno pepper. Sounds spicy, right? Not really! If you remove the seeds, the pepper is not nearly as spicy as you'd think and the corn was SO naturally sweet that I actually think the next time I make it I will add more japapeno. Bring a large pot of water to a boil. Add corn and cook for 3 minutes. Drain and cut the kernels off the cob with a sharp knife. In a separate bowl, whisk together the lime juice, white wine vinegar, balsamic vinegar, olive oil, and cumin. 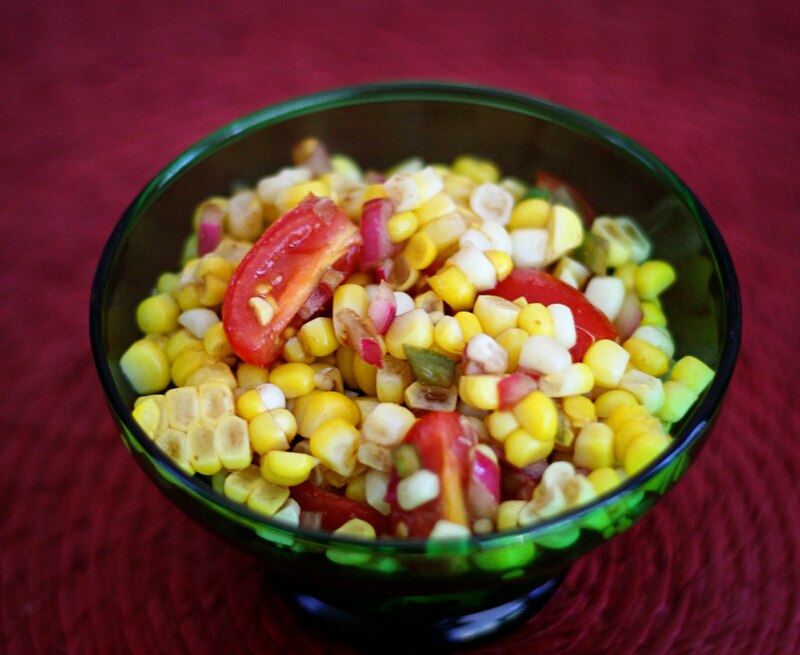 While the kernels of corn are still hot, add it to the dressing. Add jalapenos, red onion and tomatoes to the corn and stir. Allow to sit for 5 minutes or so for the corn to absorb some of the liquid. Serve hot or cold.